After getting top surgery in February and recovering at home, Emerencz Merkle is out enjoying the sun on Main Street in Vancouver. For Emerencz Merkle, one thing was always clear from the moment they developed breasts: having them did not feel comfortable or right. But three years ago, Merkle was denied healthcare coverage for top surgery — a commonly used term for mastectomy — because they did not want to transition into a man. Twenty-six-year-old Merkle identifies as non-binary, a term that refers to genders that are not exclusively masculine or feminine. Merkle uses “them” and “they” pronouns. Healthcare in both Alberta, where Merkle lived at the time of the consultation, and their current home of B.C. lists gender dysphoria as a reason for top-surgery coverage. But these choices are made on a case-by-case basis during a consultation with a government-assigned gender psychiatrist. Merkle was turned down for healthcare coverage for the operation. So they chose to go outside the government route and booked top surgery with plastic surgeon Dr. Hugh McLean in Mississauga, Ont. When they were around 21 years old, Merkle began using a binder to lessen the appearance of their breasts. Merkle and girlfriend Lillea Goian are back to their routine in Vancouver after fundraising for Merkle’s surgery. People can develop chronic pain and breathing and lung issues when they bind for too long, according to Lu Lam, a Vancouver-based clinical counsellor. Merkle wanted to get the top surgery so they could feel more comfortable with their body and have a healthier option than binding. Many doctors who perform these operations see them as essential for health. But many top-surgery hopefuls end up waiting a long time, both for a consultation and then, if approved, for surgery. Some never get the surgery approval. Procedures are performed by surgeons chosen by the government. Available surgeons are limited, so patients do not get to be selective. McLean Clinic was attractive to Merkle because the clinic is known for being respectful of non-binary patients. That attitude was a relief for Merkle, who said the government-assigned gender psychiatrist in Alberta did not seem to have that mindset. LISTEN – Merkle discusses their top surgery consultation, the inequities non-binary people face, and what they are looking forward to now that they have had the procedure. A fellow non-binary Vancouver resident and a friend of Merkle’s, Skylar Love, is currently on a one-year waiting list for surgery. But they too have concerns that the trans healthcare system does not properly serve non-binary individuals. That’s the kind of attitude that Lam sees permeating decisions and processes for non-binary people. The term non-binary can mean different things to the people that use it. Lam describes gender language as rigid in Western culture. While Love is going through the government route to the mastectomy, they are tempted to save up the money for a highly skilled surgeon outside of the public healthcare system. For anyone going through this, support is essential. Merkle was lucky to have the support of their partner. 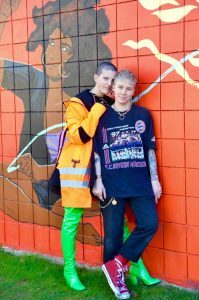 Last year, Merkle’s girlfriend, Vancouver-based fashion designer Lillea Goian, began designing and selling T-shirts to raise money for Merkle’s top surgery. Up until meeting Merkle in January 2017, Goian identified as straight. But her androgynous fashion style often caused people to call her a boy, or caused partners to try and make her more feminine. Merkle was instantly accepting of Goian, and Goian of Merkle. Merkle outside without a shirt or bandages for the first time since their top surgery. Many non-binary individuals deal with anxiety over their bodies and the inequities they face on a daily basis like housing, education, work and in bathrooms. After some unhealthy relationships, Merkle met Goian through Instagram. The two immediately felt comfortable with and supportive of each other. The surgery cost $9,080, and with flights, accommodations and recovery time, the total Merkle paid for the surgery was about $11,000. Goian and Merkle raised $3,500 in T-shirt sales and received an additional $1,000 in donations. Merkle was required to pay for the surgery upfront and used a credit card. They are currently approximately $9,000 in debt after the procedure. McLean performed Merkle’s surgery on Feb. 12 and says 18 per cent of the McLean Clinic’s top surgeries are for non-binary patients. Many of his patients are covered by Ontario’s healthcare program, but not every province has high-quality surgeons available for those under healthcare coverage. Like Merkle, top-surgery hopefuls from B.C. and other provinces often have to travel out of province to get the procedure done. McLean believes that every community in Canada should have a qualified plastic surgeon who can perform top surgery. More people, whether they are trans or non-binary are seeking out top surgery. 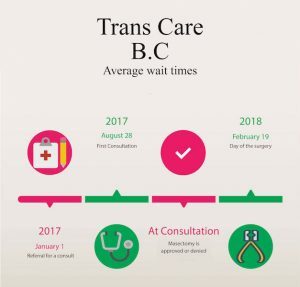 According to Trans Care B.C., there were 312 top surgery referrals in B.C. in 2017, up from 174 in 2015. Merkle sees a future where any non-binary individual can access quality top surgery, regardless of their financial situation or geographical location. “If I wasn’t living in Canada, being visibly white and coming from a middle-class family … this would not be possible for me,” said Merkle. Goian and Merkle out and about after Merkle’s recovery period. Not having access to this procedure can mean depression and a sense of hopelessness for some. Merkle says that for some people, even being on a waiting list is enough to inspire hope that one day they will look on the outside the way they feel on the inside. For Merkle, having the support of their girlfriend Goian, both in selling the shirts and actually going to Ontario for the surgery, was a wonderful experience. Merkle points to GoFundMe as a huge help in not only their fundraising efforts, but in the efforts of many of non-binary people. For Merkle, top surgery was a dream finally realized. Tags: B.C. Ministry of HealthEmerencz MerklegenderqueerhealthcareLGBTQ newsLu LammastectomyMcLean ClinicMedicarenon-binarynon-binary profileSkylar Lovetop surgeryTrans Care B.C.